Reverse Link Traffic Channel Physical Layer in CDMA, Traffic flow CDMA in uplink from mobile to BTS and details notes for reverse link traffic channel in cdma. The CDMA reverse link uses a different coding scheme to transmit data. Unlike the forward link, the reverse link cannot support a pilot channel for synchronous demodulation (since each mobile station would need its own pilot channel). The lack of a pilot channel is partially responsible for the reverse link’s lower capacity than the forward link. In addition, Walsh Codes cannot be used for channelization since the varying time delays from each mobile to the base station destroys the orthogonality of the Walsh Codes (varying arrival time makes the Walsh Codes non -orthogonal). Since the reverse link does not benefit from non-interfering channels, this reduces the capacity of the reverse link when compared to the forward link (all mobiles transmitting interfere with each other). To aid reverse link performance, the 9600 bps voice data uses a one-third rate convolutional code for more powerful error correction. 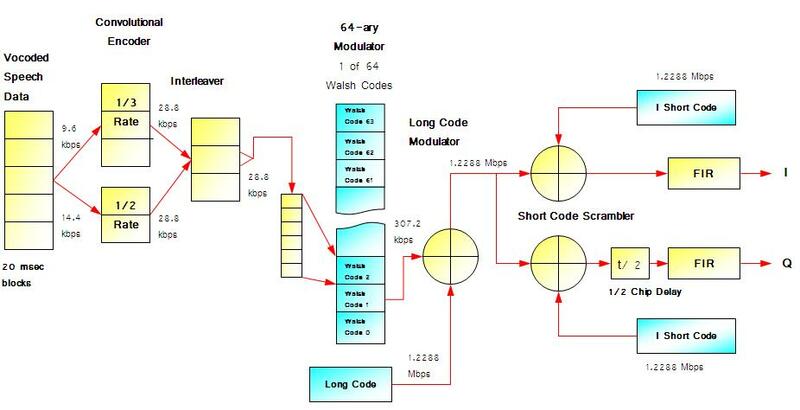 For the 14400 bps vocoder, the convolutional encoder is only a half rate encoder that doubles the data rate. Thus the data rate coming out of the convolutional encoder is the same for either the 9.6 or 14.4 kbps voice channels. Then, six data bits at a time are taken to point at one of the 64 available Walsh codes. The data, which is at 307.2 kbps, is then XOR’ed with the long code to reach the full 1.2288 Mbps data rate. This unique long code is the channelization for the reverse link. 26 queries in 0.320 seconds.